One of the more common thermoplastic materials, nylon is strong, stiff, and very lightweight, with outstanding bearing and wear properties. Nylon is also sometimes refered to as Zytel, which is the trademark name from DuPont. Zytel or nylon is used for a number of different high strength, abrasion and impact resistant thermoplastic polyamide formulations. As such, it is often used as a material replacement for metals such as bronze, brass, and steel, as well as wood, rubber, and other plastics. Nylon plastics are relatively easy to work with, and Upland Fab has decades of experience working with these materials. We can deliver the complex, high precision nylon parts and components you need. In addition to the above-mentioned properties, nylon plastics also exhibit good resistance chemicals, alkalis, dilute acids, and oxidizing agents, good wear resistance, a high modulus of elasticity, and high resistance to impact, abrasion, and vibration. Nylon thermoplastic parts offer significant noise reduction over metal parts, and induce less wear on mating parts. Nylon plastics are available in a broad range of grades and formulations, each of which exhibits unique characteristics that may be better suited to your specific application. Contact us to discuss your material requirements. Upland Fab utilizes multi-axis machining to produce high precision nylon thermoplastic parts. Our state-of-the-art CNC machining technology enables us to manufacture your parts with minimal handling and fixturing requirements. In most instances, even the most intricate parts can be completed in a single operation, for significantly reduced turnaround times. Our DPD/MBD processes (Digital Product Definition/Model-Based Definition) allow us to work directly from your digital CAD models. By working straight from your design files, we can eliminate machining errors and improve the accuracy and precision of the resulting parts. Ultimately, this gives you better quality parts at lower prices. When you work with Upland Fab, you’ll have a single point of contact throughout your entire project. We know that timely communication is critical, and we’ll provide consistent, reliable updates to keep you informed on the progress of your project. We give you all the information you need, and the peace of mind you want. Upland Fab delivers top quality nylon thermoplastic parts and components. Request a quote to get started, or contact us for more information. 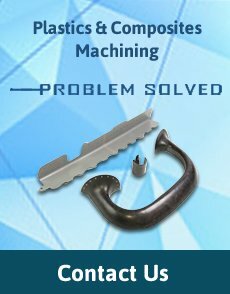 We have been providing top-flight plastics and composite machining in Southern California since 1970. Contact Upland Fab to learn more, or request a quote to get started on your project.